Consumers spend their lifetime working toward that magic number that will allow them to retire. Unfortunately, many pre-retirees leave out an important detail that could cost them a large portion of their retirement savings. Jan. 31, 2019, 11:14 p.m.
Jan. 31, 2019, 6:22 p.m. In order to retire comfortably, it’s recommended that you save a good amount, and we’ve discussed how much money is “enough”. It turns out there is no single number that fits everyone’ retirement needs. You often hear the media and financial experts recommend having at least $1,000,000 in savings in order to retire. The actual number depends on desired lifestyle, income sources like pensions and social security, expected lifespan, and risk tolerance. With the uncertainty of Social Security and other pension benefits, you may need a more conservative calculation to set yourself up for a successful retirement. To calculate how much you need, you should consider several factors including, your income streams once you retire, your safe withdrawal rate, and any major expenses you will need to cover using your retirement savings. Estimating your retirement number can be complicated and complex. You may find it beneficial to enlist help from a financial professional. If you are into doing it yourself, you may find our income spending simulator useful. For example, let’s say you add up all your expenses and income and determine you need $500,000 in order to support your lifestyle in retirement. This may seem like a large sum but there may be one important detail you're excluding: inflation, which is the idea that prices slowly rise over the years. While pre-retirees are focusing on saving as much as they can, they forget to factor in inflation. They calculate how much they will need in today’s dollars instead of calculating the future value of their portfolio. Not including inflation into your retirement calculations can be a financial disaster. It is very easy for people to miss the impact of inflation. Prices rise slowly, and sometimes not at all, so it is hard to notice. If you think back 20 - 30 years ago prices were about half of where they are now (generally speaking), so it takes twice as much money to buy the same thing. This has to do with more money being in circulation (the government printing money) and a few other factors which we outline in our post on inflation. If you plan to flourish in retirement for 10, 20, 30, or even 40 years, you’ll notice a significant difference in the value your money holds. If we use the $500,000 estimate above, you would need $1,023,203.70 in future dollars to maintain your spending power 30 years from now. That number assumes a 2.5% rate of inflation. In reality inflation isn't consistent year to year. 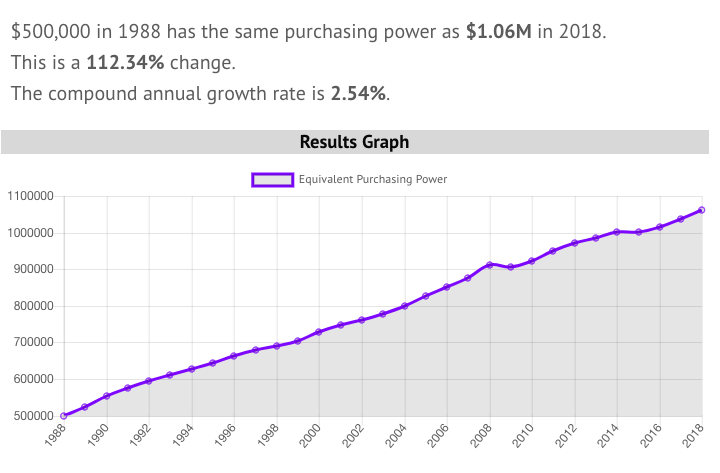 According to our inflation calculator, from 1988 to 2018, inflation was on average 2.54%. Now that you understand how inflation can silently kill your retirement, what do you do about it? The first thing to do is think in terms of real returns (purchasing power) vs nominal returns (what it says on paper). Whenever you look at interest rates, pad the amount by the expected amount of inflation. For example if your bank account is paying 3% (the nominal rate), but inflation is 2.5%, your "real rate" is only 0.5%. If you need to average a 5% return on your portfolio that means you need to earn 5% plus whatever inflation is (more like 7.5%). Educate yourself. The first step to managing inflation is to learn about it and stay up to date on financial news. This is also a good time to learn about how your expenses will be impacted in retirement. Estimate the length of time you will be in retirement. Calculating the number of years you’ll be in retirement will help you prepare for future costs. Vanguard has a calculator that helps with this. 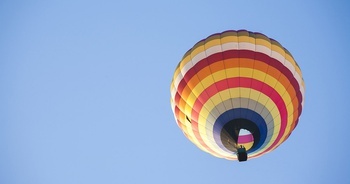 Develop a plan to manage inflation. Investing in assets that increase in value above the rate of inflation is key to keeping your retirement above water. Treasury Inflation Protected Securities or TIPS are a popular inflation protected investment. TIPS are attached to the Consumer Price Index, meaning their value increases as inflation increases. There are many other asset categories to consider (stocks, precious metals, commodities, REITs, and real estate) some of which tend to keep pace with inflation, but they are also driven by other market forces so there is no guarantee. Delay your Social Security benefits. Delaying your Social Security benefits can increase your overall payout. If you’re in good health, you may want to delay your benefits until age 70. This will lessen the blow of inflation in later years. Save and invest as much as you can. It’s recommended that you automatically save and invest at least 10% to 20% of your annual income. This will help you establish a secure nest egg for your future retirement. Inflation doesn’t have to kill your retirement. By taking action and understanding the impact it has on your saving, you can combat inflation on day at a time.